If you fly them, they will come. And they do, every year. 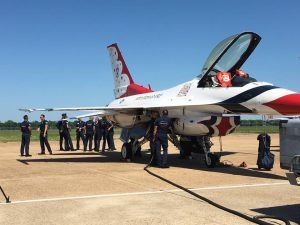 Visitors and locals alike show up en masse to hear the sound of freedom and see Air Force muscle in the skies above Bossier via the Barksdale Air Force Base Defenders of Liberty Air Show. 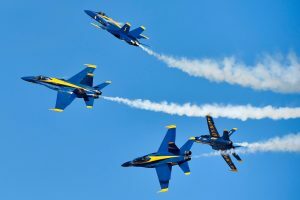 This year’s show, which will be held May 6-7, 2017, will see a crowd of more than 100,000 descend on Barksdale for two days of thrills headlined by The Blue Angels, the U.S. Navy’s premier aerial demonstration team. Other acts will include acrobatic pilots, a P-51 Mustang, A-26 Invader, MiG-17 and the U.S. Army Golden Knights parachute team.There will be a variety of static displays on the ground, with crew members on-hand to answer visitors’ questions. One of those visitors is Dallas, Texas resident Clayton Ray. As a pilot, himself, he has a love of aviation and particular fascination with Barksdale’s signature aircraft — the B-52 bomber. “Nearly joining the Air Force out of college, I enjoy the opportunities to see the B-52 and other high performance military aircraft in action. It’s a great sight and something to really enjoy and to be thankful we have such great air power in the USA,” Clayton said. He also plans to hang around for a little while after the show. Barksdale Air Force Base Air Show fan Mark Patterson’s family. But out-of-towners aren’t the only ones who will be taking in the sights and sounds of the nation’s air superiority. Shreveporter Mark Patterson said his daughter is a huge fan of the show and he takes her each year. “My daughter enjoys seeing the performances and what the acrobatic planes can do. She likes talking to the crew and getting answers to all the questions she has about the different planes,” he said. Mark also brings up a good point about the show — it’s a rare open house and glimpse at the workings of a living, breathing military base. If you want to get a peek behind the curtain and see what the Air Force has in the skies above, gates open at 9 a.m. and the show will begin at 11 a.m. each day. Admission is free. Attendees can access Barksdale Air Force Base through Northgate Road in Bossier or Westgate off Barksdale Boulevard. Food and drinks will be available for purchase at the air show. There will be water bottle filling stations throughout the spectator area and sunscreen is highly recommended. 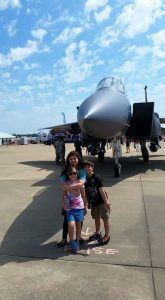 For complete details, including security information and guidelines, visit www.BarksdaleAFBAirshow.com. Or keep up with this year’s air show by liking their Facebook page.